Things to do in Chiang Mai | CNXGuide.com - your guide to Chiang Mai, Thailand! Chiang Mai has a huge range of activities to offer visitors. It's a historic, yet modern and creative city with many things to do and see. 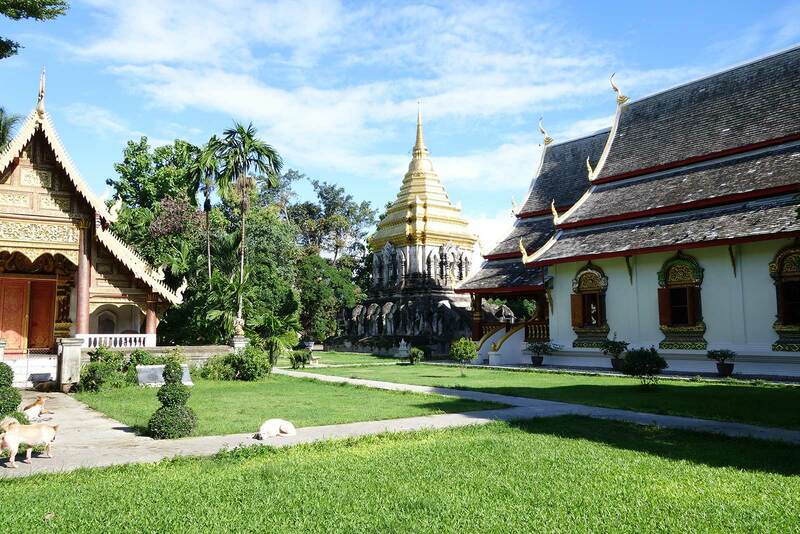 Below are some of the most popular attractions in the Chiang Mai area. There are over 30 temples in the walled Old City and plenty more on the outskirts of Chiang Mai. Almost all the temples are free to visit and you can freely wander around. One of the most famous temples to visit in Chiang Mai is Wat Phrathat Doi Suthep, which overlooks the city from the Doi Suthep mountainside. The "old city" is the original Chiang Mai, founded in 1296 and as at one time the capital of the ancient Lanna Kingdom. The entire 1 mile square city is surrounded by an ancient wall and moat. There is plenty to do and see while wandering the small, not-so-busy (compared to the rest of the city) streets of the old city. The old city is home to most of the budget guesthouses and you'll see travelers of all types within the walls of Old Chiang Mai visiting temples, eating at authentic Northern Thai restaurants and hanging out in cool coffee shops. Chiang Mai has an overwhelming amount of great food choices. Vegetarians especially love Chiang Mai for all the vegan food options. No visit to Chiang Mai is complete without having the famous Khao Soy dish, which is a noodle soup that is absolutely amazing! Chiang Mai is famous for it's coffee shops and for good reason. There are dozens, if not hundreds of them all over the city and they almost all serve high quality, local coffee and have fast wifi! Many people come to Chiang Mai to enroll in cooking schools. There are several quality cooking schools all over the city that offer a short and long term classes to help you learn how to cook authentic Thai food.